This book offers a simple, yet a critical shift in perspective. In an increasingly complex world where agendas are unlikely to align, an essential skill is to be able to align actions for mutual benefit instead. In just a few hours this book helped me see that collective progress is more valuable than shared purpose. Highly recommended! 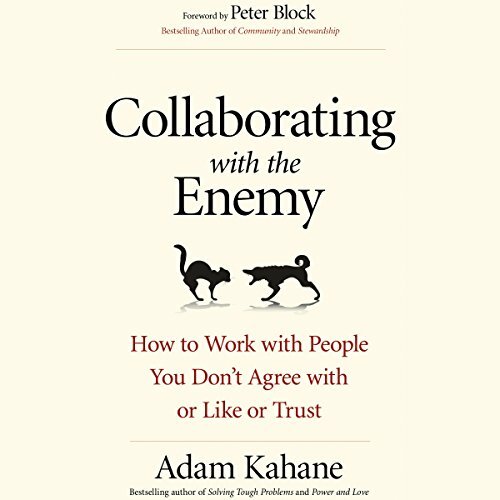 The myth of collaboration equivalent to full agreement is debunked by Adam Kahane in this work. The author uses examples of high stakes and very complex negotiations to show that collaborating/negotiating is not about reaching a given result or persuading others to your point of view but about the ability to move forward, one step at a time. This book is not about easy wins in negotiation but about negotiations that endure. I listened to Kahane's interview on CBC Radio and was left with the impression that his book would provide practical solutions for dealing with the classic "problem" people at work or in one's social circle. It is, instead, a model for promoting cohesion in large companies, governments, or other such large organizations. Not a bad premise on which to base a book, but what are its applications in the trenches? If I can paraphrase Kahane's philosophy in a nutshell, we're not going to change people's negative attitudes so let's work around those attitudes. How? Can you give us examples? The book is all talkie, no walkie. A head of state or the CEO of a large company might want to examine Kahane's proposals while crafting adjustments to corporate management style, but there is little here to enlighten low level department heads or snipers at the water cooler. I wouldn't classify this as a "How to" book, but rather a self assessment book on how better collaborate and negotiate.As seasoned collaborator he shows that multiple times, it's easy to fall into patterns that jeopardize effective negotiation and that the belief you need to have the same principles and goals should not be an obstacle...because if it was all that simple... why would you be consider reading it ?